Folder Guard® is a powerful computer security program that you can use to control access to files, folders, and other Windows resources, such as Control Panel, Start Menu, and so on. You can use Folder Guard to lock your personal files and folders with passwords, to stop other users from peeking into your records. You can even completely hide your private folders from virtually all applications, and such folders would remain invisible until you enter a valid password. You can also protect sensitive system files from modification or destruction, disable access to the removable drives, restrict access toControl Panel, and more. >> Folder Guard lets you password protect your files and folders. You can protect with password virtually any folder or file, allowing only the authorized users to open the protected files or folders. You can protect an unlimited number of files and folders, each with its own password, or you can use the Master Password of Folder Guard to unprotect them all at once. >> Folder Guard can hide your personal folders from other users. >> Folder Guard can restrict access to Control Panel, Start Menu, Desktop, etc. You can set up Folder Guard to allow only certain users to change the computer settings with Control Panel, while denying that to other users. You can control access to various settings of Start Menu, Desktop, Taskbar, and other Windows resources. You can remove the Run and Search commands on the Start menu, hide specific drives, lock the Internet settings, and more. >> Folder Guard is suitable for a wide range of the computer security tasks. You can stop other users of your computer from peeking into your personal files. You can protect the system files and folders from destruction by cyber-vandals. You can allow specific users to run a program while deny it to others. You can allow users to use the removable drives to store their documents while prevent them from running unauthorized programs from the removable disks. >> Folder Guard protects your files without encrypting them. There is no risk of losing your documents if you lose your encryption key: with Folder Guard all your files remain intact, without modification of any kind. >> Folder Guard lets you quickly enable or disable the protection via a "hot key". You can choose a specific keyboard combination as the hot key of Folder Guard, to be able to quickly enable or disable the protection of your computer. Of course, the "hot key" is protected with your password, too, only you can use it! >> Folder Guard can operate in the "stealth mode". You can set up Folder Guard to operate in the stealth mode, to hide its own files and shortcuts from being seen by other users. You would still be able to control Folder Guard via the "hot key". >> Folder Guard supports easy recovery in case of emergency. 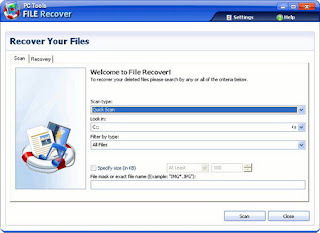 If you forget your password, or experience other problems, simply use the Emergency Recovery Utility (free download) to quickly restore access to your protected folder. >> Folder Guard works with drives of any format. If your computer can handle it, Folder Guard can protect it. You don't have to format your hard drive with the NTFS file system: Folder Guard can protect files and folders on both NTFS and FAT/FAT32 disks. >> Folder Guard runs on a wide range of Windows platforms. From Windows 2000 to Windows XP to Windows Vista and later, with all service packs and hotfixes, all are supported by at least one of the available editions of Folder Guard. >> Folder Guard is easy to use. Folder Guard sports one of the most intuitive user interfaces, that makes it easy to use for both novice users and computer professionals. >> Folder Guard "speaks" plain English. You don't have to be a computer professional to understand how to use Folder Guard. The Quick Start Wizard can guide you through the steps necessary to set up the password protection of your personal folders. Folder Guard Advisor warns you about situations that may require your attention and offers possible workarounds. Folder Guard User's Guide describes its commands and operation in plain English, without "pseudo-techno" or "geeky" talk. (And it does not baby-sit you either). >> Folder Guard is not a toy. Folder Guard is used by large corporations and small businesses, schools and police departments, universities and correctional facilities, libraries and hospitals (to name a few). >> Folder Guard is widely used. Hundreds of thousands of copies of Folder Guard have been downloaded by computer users from virtually all countries of the world. >> Folder Guard offers the best value for the money. None of our competitors offers a product that would come close to Folder Guard. >> Folder Guard is flexible. Although Windows lets you restrict access to folders located on a NTFS drives, it cannot hide them. With Folder Guard, you can not only restrict access to, but also hide folders, or make them look empty. Unlike Windows, Folder Guard lets you protect only some files within a folder, and keep the rest of the files visible and accessible, if you wish. Or, you can protect files and folders each with its own individual password, and then unlock them separately from each other (Windows cannot do that). >> Folder Guard can be used with other disk tools. You can designate your anti-virus and other disk maintenance tools to be the "trusted" programs, to make them able to work with your protected disks without restrictions. >> Folder Guard is extensible. You can fine-tune the access rules to the files and folders of your computer by creating appropriate filters. >> Folder Guard will save you hours of learning time. You don't have to learn how to use the Group Policies, user groups, Access Control Lists, privileges, and other built-in security features of Windows, because Folder Guard does the hard work for you: its visual and intuitive user interface lets you manage the restrictions with ease. >> Folder Guard is actively maintained. Since its first release back in 1997, we've been continuously extending, enhancing, and improving Folder Guard. Now in version 7.92, Folder Guard gives you more power than ever. JAlbum is a program that helps you make from your digital photos HTML albums. Its creators say it is most severe, but also one of the most powerful in the industry. It takes your pictures, a few clicks of the mouse and your album is ready - in the HTML version you can publish on the Internet. 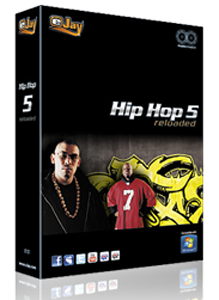 Sample albums by the program, you can see here.With the proliferation of digital cameras, each day there are more users who forget to disclose reels and work with their photos directly on your computer. The problem comes when it comes to ordering these images or teach a friend, role that until now the traditional photo album. Die legend?re Musiksoftware ist wieder verf?gbar mit vielen neuen Features. Engaging learning experiences are the foundation of a great education. Learn how Adobe software can help faculty, teachers, staff, and students maximize their resources for optimal educational impact. Deliver information to the edge by transforming and extending processes to provide a richer, more productive, and trusted experience with constituents, agency personnel, and the military. Learn how Adobe software can help. Bring the power of professional-quality video and audio to your creative projects and business communications. Learn how Adobe's pre- and post-production software can help you deliver stunning results on film, video, DVD, the web, and mobile devices. PHP DESIGNER was created to help you enhance the process of edit, debug, analyze and publish PHP scripts all wrapped into a sophisticated streamlined interface! Get the complete IDE. Small in size but still one of the most popular award-winning IDE for editing, debugging, analyzing and publishing application- and websites powered by PHP and other web-languages. * Automatic close single- or double quotes, brackets etc. -Windows - Recycle Bin, Recent Documents, Temporary files and Log files. Folder Guard® is a powerful computer security software that you can use to control access to files, folders, and other Windows resources, such as Control Panel, Start Menu, and so on. You can use Folder Guard to lock your personal files and folders with passwords, to stop other users from peeking into your records. You can even completely hide your private folders from virtually all applications, and such folders would remain invisible until you enter a valid password. You can also protect sensitive system files from modification or destruction, disable access to the removable drives, restrict access to Control Panel, and more. Supported platforms: Windows 7, Vista, XP, 2000, Server (32- and 64-bit). * A problem has been corrected that caused the mapped networked drives not to be protected as expected in some situations. 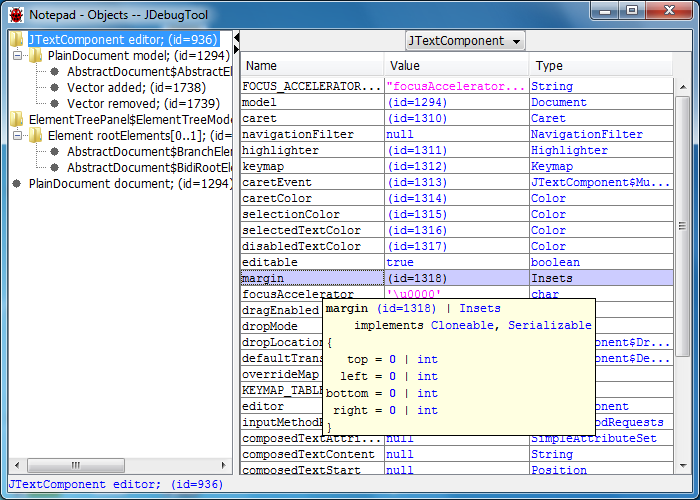 The JDebugTool® graphical Java™ debugger. 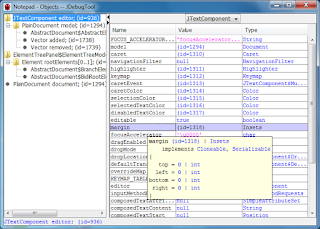 JDebugTool requires JDK 1.5 (Java 5) or JDK 1.6 (Java 6) to run itself. Built on top of the standard JPDA (Java Debugger Platform Architecture), JDebugTool should be able to debug any JPDA compliant JVM -- debugging targets of JDK 1.3, JDK 1.4, JDK 1.5 (Java 5) or JDK 1.6 (Java 6) are supported. The Java Swing GUI is logically divided into resizable panels and popup windows. Data is color coded, and displayed in trees and tables (tables can be sorted and table columns can be hidden or shown). There are tool tips, right-click popup context menus and keyboard accelerators throughout the GUI. Specify whether the Main Window is divided into a four or six resizable division layout. Change the Look and Feel and also the font size of the GUI. Specify a hint for the maximum number of lines in a tool tip. View beginning object fields, array values, and String data as tool tips, throughout the GUI. Display (and quickly navigate to) the class (including inner classes) and corresponding methods hierarchy obtained by parsing the top displayed Java source file. TuneUp Program Deactivator, a unique tool that drastically reduces the load on your PC, giving you a true performance boost. It combines important aspects of system configuration, security, cleaning and maintenance under a modern interface. You can remove unnecessary files from your hard disk(s), clean and optimize the registry, tweak your internet connection settings, recover deleted files, optimize memory and view hardware information and tips. TuneUp Utilities also includes an Uninstaller, registry Editor, Task Manager and even an Undelete tool to recover files that have been deleted from the recycle bin. All operations performed on the operating system are completely safe, because all changes are monitored by TuneUp Rescue Center and can be undone at any time. The software helps both beginners and experts to make Windows meet their needs in a way that is better, easier and safer. All important system options are explained in an easy way and can be turned on or off at the click of your mouse. TuneUp Utilities will then make the necessary changes in the registry or boot files automatically. Most changes that you make can be undone in TuneUp Rescue Center - easily and safely. TuneUp Utilities automatically runs important maintenance tasks for you, makes you aware of any problems and offers simple solutions. You can also use TuneUp Utilities to customize the appearance of your Windows system - to make working on your computer more enjoyable. The TuneUp Turbo Mode provides an immediate performance boost whenever you need it. When you use your computer in the TuneUp Turbo Mode, an analysis is performed to see which tasks, programs and functions are currently running in the background that are not strictly necessary. These programs are stopped or slowed down, allowing the additional processing power gained to be used exclusively by the programs you are actually running. Regular maintenance increases the stability of your PC, but is complicated and takes a lot of time when doing it manually. With TuneUp Utilities, you can clean up your computer and delete unnecessary files with only one click. Whether you are working or gaming: TuneUp Utilities increases the performance of your PC. Programs that are used rarely or never are tracked down, startup processes are shortened and unwanted garbage files are eliminated. With only a few clicks, you can fix typical Windows problems easily. TuneUp Utilities finds errors on data carriers and fixes them automatically — about 60 of the most frequent problems under Windows. TuneUp Utilities can even restore files deleted by accident — quickly, easily, and reliably. Give your Windows a new look with TuneUp Utilities and customize programs and system settings to meet your needs: boot screens, icons, and animations provide that personalized look for your Desktop. Windows runs as fresh as it did on the very first day. The services, startup entries, background processes, or scheduled tasks in a program that are turned off will remain inactive until you need them again. This way you avoid the loss in performance that is always a danger after many programs are installed. One recommendation for Windows: Uninstall programs you no longer want to use just as you did before, and use TuneUp Program Deactivator to turn off that software you use only rarely, until you need it again. Now 10 times more powerful than before, brings your PC to maximum speed for your work and games. Know instantly how well you've optimized your PC. Tuning status shows how many optimizations have already been performed with TuneUp Utilities, and what potential for optimization still remains. You will never forget or overlook a single tuning measure again. With a single mouse click, shut down over 70 background processes that slow down Windows. By pressing a button, you get an immediate boost of power when working at your PC, a smoother gameplay, and complete control over background activities that slow down your computer. The experiences of countless TuneUp Utilities users help you make the best tuning decisions. Windows performs best and is most effective when you turn off programs, deactivate startup entries and/or uninstall third party software that you don't need on a daily basis. But it's often unclear what lies behind a cryptic program entry. The new rating functions supports you here to make better decisions on each program. The new "Overview of all functions" view on the Start Center gives you instant access to all 32 TuneUp Utilities features and settings. TuneUp Utilities is easier to use than ever. The fresh look of the Start Center helps users find all optimization features in seconds. Features stand out more clearly as they are now divided into five categories for maximum readability and immediate access. TuneUp Utilities tuning highlights appear immediately under the categories of "Status and recommendations", "Optimize system", "Gain disk space", "Fix problems", and "Customize Windows". Turbo Mode can now be launched from any category at the click of a mouse, and Tuning status is always visible. Formatted partition? Formatted SD card? Formatted pen drive? Formatted partition when reloaded Windows OS and lost files? Drive reads "the drive is not formatted, do you want to format it now?" 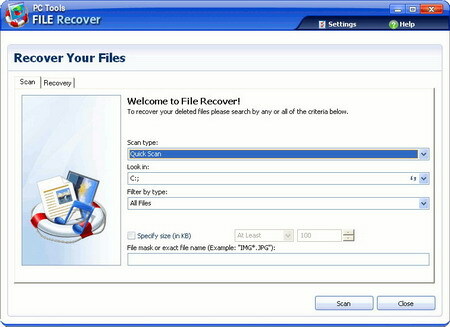 Try iCare Format Recovery, which is all you need for fixing all format related problems. It is pretty useful when you accidently formatted hard drive, lost photos from digital camera sd card, lost files from memery card, flash card, pen drive, removable hard drive.